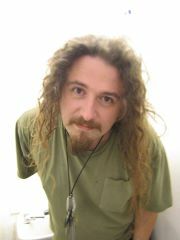 Simon joined Amstrad Action as a teenager, but ended up being remembered as one of CF’s most colourful and memorable writers. Simon! So, before we get started – where have you been since the very last Commodore Format in 1995? I’d like to say “ooh, I’ve been all over,” as a lot of the people I worked with at Future now do international jet-set jobs around the world, but I stayed in Bath for 20 years, only moving away last November to live in a tiny little village in the middle of nowhere (for ‘nowhere’, read ‘Somerset’). Professionally, it’s been a bit odd – after CF, I did a variety of freelance jobs around Future, before going back full-time to run SFX‘s web presence and put together the Future Gamer launch. I left Future for good in ’98, and ran the build team for a small web company, before leaving that in ’99 to start a market research company (with, bizarrely, a few old CF luminaries – Trent Webb, Bob Wade – and Neil Jackson, who came from the 16-bit world). In late 2001, Trent and I left to build websites full-time, and I’ve been doing that ever since (though Trent headed off to excel in internet marketing elsewhere a few years ago). These days, I spend my time building web-based systems for the legal sector, and being paid by the government to stride around with a Powerpoint clicker in front of rooms full of people, talking about digital marketing. Take us back to the mid 90s when you got the staff writer’s gig on CF, then. How did you end up on Commodore Format? Didn’t you start out at Future on Amstrad Action? I took a year out between A-levels and university, because I was getting a bit hacked off with education, but a month or so into that, got a call from a friend (Richard Fairhurst, who used to write for AA) telling me there was a staff writer position coming up, and that I should apply. I trundled down to Bath and was hired in the interview, moving there to start work on my 19th birthday. At that point, AA, CF, and Your Sinclair were huddled together for warmth around a dying bonfire, so it got a bit interchangeable as to who was on what for a while – when they needed to drastically cut down the staffing, I ended up writing for both full-time. Meanwhile, after deferring my place twice, Manchester Uni decided I was taking the piss, and told me to get bent. I didn’t care, because I’d had just as good an experience – moving out, learning a lot, having a lot of fun, but getting paid for the privilege! You were on CF twice, of course. First as staff writer under Andy Hutchinson, and you came back to edit the last three issues. We’ll get around to the very last days of CF in a bit, but first tell us what a typical day was like as a staffie. There are two ways of looking at it. The first way involves picturing an eight-hours-a-day elastic band fight with Hutch and [art editor] Ollie. The second way? What you saw in the magazine was what happened – we’d get games in, play them as far through as we possibly could, and write about them. I’d love to imply that I had the same level of skill and professionalism as the true CF luminaries like Steve Jarratt did, but I certainly didn’t – it was my first ever job, and I spent it learning about how magazines were put together. And then you had the art guys – the likes of Ollie Alderton and Andy O – who really were the reason those magazines got to the shelves on time. Future was born of the DTP revolution, but those two would still think nothing of sitting with scalpels and manually laying things out when the job required it. It was a hell of a lot of fun – we weren’t sitting quietly in a huge room concocting a fiction or pretending it was more fun than it was, and we weren’t running around in a high-pressure, Hollywood-style office shouting about copy deadlines. When I’ve popped back to Future to see friends, it all seems a lot more reserved and business-like now – it was of the era, I guess. People used to really enjoy your style – very different to what had been on CF before. You were the only person who actually said out loud what everyone else was thinking about C64 Lemmings, for example…I’m really touched to hear that! When you fetched up at Future on those magazines, they gave you a mantra and a truth. The mantra is that the magazine is supposed to be the equivalent of your friend who drops ’round once a month to play on your computer with you. I guess I was the friend your parents didn’t really approve of so much, and probably blamed for starting you smoking. The truth was that most of the readers got two games per year: one for birthday, and one for Christmas. It was certainly that way for me growing up – £1.99 games were things you’d buy with pocket money, but some of these things ran to £20. If I’d have gotten a game for Christmas that turned out to be a pile of pap, I’d have been utterly disappointed. If that’d happened to someone else based on our recommendation, we’d have been mortified! It got me into trouble a few times in my career – the occasional phone call from a livid game company threatening to pull advertising, a few empty threats of legal action for jokes that went a little wide of the mark, but overall we just wrote with our personalities. Clur [Hodgson] and James [Leach] really were that clever and funny, Ollie was (and still is) that punk rock, and Jon Pillar/Nash (for any Your Sinclair readers out there) really was that strange. Actually, in all fairness, he was even stranger. If anything, it was dialled back for print. Did you have to sort out the PowerPacks? Everyone tells us they were a right pain in the arse to do – probably doubly so towards the end with hardly and budget, right? Were there any games you chased and never quite managed to secure? I escaped the pain of the PowerPacks, but only because I’d suffered enough doing the Amstrad Action tapes. They. Were. A. Nightmare. You’d spend your time schmoozing around the different companies, trying to stretch what accountants would refer to as “an embarrassing sod-all of a budget” to get decent games for the thing, to an impossible deadline. If you were having a good month, you’d secured games months in advance, but one month out of three was a last-minute scrabble with panicked phone calls to Steve at Ablex trying to see how late you could push the production run. And then, AND THEN, it became horribly apparent that a big chunk of the readership only bought it for the tape anyway, and pretty much threw the magazine away – you’d put instructions for it on a spread immediately after the contents page, or sometimes before, and you’d still get inundated with calls on newsstand day from people who hadn’t so much as opened the mag to find them. That used to get you down, because it sort of devalued the time you’d spent on the good bit – the mag itself. One of the main reasons people are so interested in what you’ve got to say is that you were CFs last ever editor. But by the time you got there it was down to 22 pages and there didn’t seem to be any money for anything. Was it great to be an editor but a bit unnerving being the one person responsible for the entire magazine? It can’t have helped there wasn’t much left to talk about…Oh, the joy of a self-covered magazine printed on bog-roll with potato shapes. Will the last person to leave please turn out the lights? It was a bit scary, yeah, because as you say, nothing was really going on with the C64 at that point. Also, I wasn’t an experienced editor – I was just the last person there who knew enough about the machine to be able to do it. Is it true that there was a bit of ill feeling within Future about the way both CF andAA had been wound down, almost to try and squeeze out the very last pennies of profit? A few people have said Future’s new owners were a bit embarrassed about having eight bit magazines still on the go at all…Looking back, I see it very differently. I’m not sure exactly how it works today, but back then those magazines had a really simple economic rule: the cover price of the magazine covered the cost of production, printing and distribution, and the ad revenue was the company’s profit. With the C64 in the position it was, the ad revenue was negligible, and with a reduced readership, the economies of scale for production just weren’t there. A thriving, committed home-brew movement is all well-and-good, but it doesn’t make for the ten-thousand-plus readership you need to make a magazine work, and it doesn’t create the kind of content that a magazine needs in order to appear credible to those other, non-“come on chaps, there’s life in the old dog yet” readers. If anything, AA and CF‘s publisher kept them running far beyond that point, defending it against that embarrassment for as long as they could. I don’t think they were squeezing out any pennies of profit at all, so much as trying to limit the loss it made in order to keep it going. How did you find out Commodore Format was closing – do you remember the day and how it happened? The last days of CF are something nobody’s talked about before and you’re the one guy who’d know about it best. From what I remember, it was a meeting with the publisher and myself, and had very much a “yeah, it’s time” feel to it. I don’t want this to be damning the C64 – I don’t mean that at all (for fear of raising the ire of an army of devotees marching on this sleepy little village with badly-pixelated pitchforks) – but the magazine had run its course, and was sliding into the fanzine model. That friend was still dropping ’round once a month, but you started to realise that he was metaphorically in his thirties, still living at home, with the same race-car wallpaper. 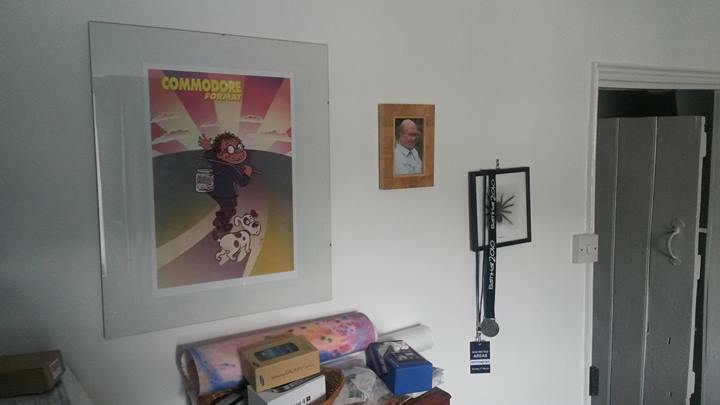 Simon’s passion for Commodore Format and the ’64 is in no doubt – and he’s still got Roger Frames on his office wall to this day. We don’t wanna end our chat on a low, Simon – so before you go, tell us what your favourite C64 game was. Mayhem aside, there was one I can’t remember the name of for the life of me – side-on third person, a spaceman stranded on an empty planet, with a much-touted ‘real-world physics engine’. Exile? Yes, Exile! That and, of course, Elite. I’m desperately hoping that the Kickstarter release delivers the same weird, magical moments that the original did! Read Simon’s editorial piece on Mayhem In Monsterland at 20 here. Simon Forrester edited Commodore Format’s final three issues. This interview is copyright Simon Forrester and the Commodore Format Website/Facebook Page. It may not be reproduced in whole or part without permission. To make contact, go to our legal page. Great interview; by the time the end rolled around my local shops had all stopped stocking CF, so I never really saw how the end played out, but Simon comes across as genuine and purely interested in the games, which is really all I expect, I do think that many modern journalists lack the anarchic streak that was so prevalent back in the day. Also: EXILE! I spent so much time on the demo of that; one of the best demos ever. I never did find a full copy of the game. I miss that sense of adventure from the early days of gaming; mechanics weren’t set in stone and the industry wasn’t so big, so games could catch you completely off guard the way Exile did; it was a pure, exciting adventure. I still remember going absolutely mental in the newsagents because they’d messed up my order for Commodore Format. Thanks very much for a great magazine, you’ve no idea how much Iooked forward to getting it!